World War 2 ended in the Pacific on 15 August 1945 following the atomic detonations at Hiroshima and Nagasaki on 6 and 9 August respectively. The war in Europe had ended on 8 May. Before then the German Waffen SS had launched over 3000 V-2 ballistic missiles with conventional explosive warheads at targets in liberated Europe or England. In the years since the end of the war successive nations have sought to combine the two technologies of nuclear weapons and ballistic missiles for their delivery. Recently India, which carried out its first nuclear test in 1974, has been seen to be making significant progress with ballistic missile delivery systems developed by their Defence Research and Development Organization (DRDO). The three-stage Agni-V ballistic missile was successfully launched in April 2012 (left) and is credited with a range of 5000km and a payload of 1000kg said to be three nuclear warheads. Shortly afterwards there was areport of an Agni-VI to be trialled in 2014 with a longer range of 8000-10000km (see below) and a larger payload. Missiles with a range of up to 5500km are usually classified as intermediate range (IRBM), above that as intercontinental range (ICBM). India in April yanked open the door of the exclusive ICBM (intercontinental ballistic missile) club with the first test of Agni-V. Now, if DRDO is to be believed, India has quietly gate-crashed into an even more exclusive club of nuclear-tipped submarine-launched ballistic missiles (SLBMs). The annual awards function of the Defence Research and Development Organization (DRDO) on Tuesday [31July presumably] will see PM Manmohan Singh hand over the “technology leadership award” to a scientist, A K Chakrabarti of the Hyderabad-based DRDL lab, for the “successful development” of the country’s first SLBM. “Apart from India, this capability has been acquired only by four nations, the US, Russia, France and China. Now, the SLBM system is ready for induction,” says the award citation. Long shrouded in secrecy as a black project”, unlike the surface-to-surface nuclear missiles like Agni, the SLBM may now finally come out of the closet. Called different names at different developmental phases, which included “Sagarika” for an extended period, the SLBM in question is the “K-15” missile with a 750-km strike range. Celebrations, however, may be a little premature. Much like the over 5,000-km Agni-V that will be fully operational only by 2015 after four-to-five “repeatable tests”, the K-15 is also still some distance away from being deployed. The meaning of the word “acquired” in the award citation must be ‘indigenously developed and manufactured’. The United Kingdom ceased to develop ballistic missiles when Blue Streak was cancelled in 1960, but subsequently acquired (in the normal sense of the word) Polaris and later Trident SLBMs, developed and manufactured in the United States, and these have been continuously available at sea since 1968. The savings to the UK defence budget from this arrangement have been considerable, releasing funds for allocation elsewhere. The location of DRDO’s award ceremony wasn’t stated, but was quite possibly in New Delhi, in which case the ceremony and Mr Chakrabarti’s enjoyment of his citation may have been disrupted by the power outages in India at the time. At their worst these affected over 600 million people, about half of India’s population, a third of which has no electricity supply anyway. As Pierre Mendès-France saidgouverner, c’est choisir, (to govern is to choose), sometimes between guns and butter, though the Indian government would almost certainly regard a reliable electricity supply as a necessity rather than a luxury. … the country’s first nuclear submarine INS Arihant is getting ready “to go to sea” within the next few months. “INS Arihant is steadily progressing towards becoming operational…we are pretty close to putting it to sea (for extensive trials and missile firings),” The Navy chief’s emphatic statement comes a week after DRDO officially declared the country’s first-ever SLBM (submarine-launched ballistic missile) or the K-15 missile, with a strike range of 750-km, was “ready for induction”. 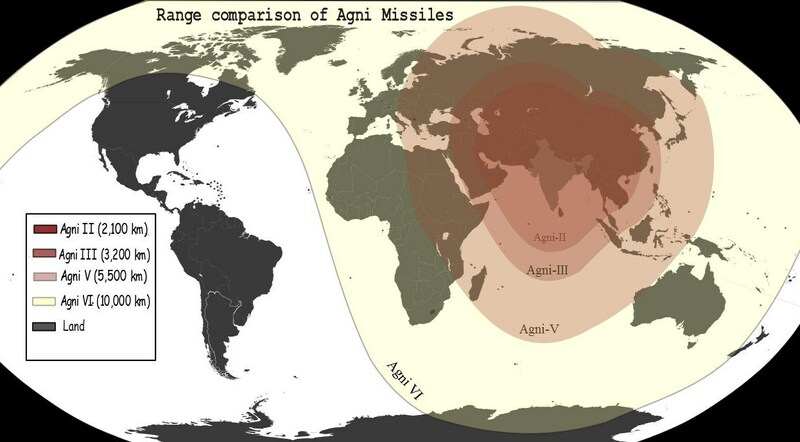 … India has for some time possessed the Agni series of ballistic missiles as well as fighter-bombers to constitute the land and air-based legs of the triad. The long-elusive underwater leg, considered the most effective for both pre-emptive as well as retaliatory strikes, now finally seems to be taking shape with INS Arihant and its two follow-on SSBNs (nuclear-powered submarines armed with ballistic nuclear-tipped missiles). The 6,000-tonne submarine, which has four missile silos on its hump to carry either 12 K-15s or four of the under-development 3,500-km range K-4 missiles, will head for sea only after its 83 MW pressurized light-water reactor goes “critical”. Although the UK has not developed SLBMs and therefore may not be regarded as being part of the SLBM club, it has had an indigenous nuclear submarine programme since 1960, including SSBNs. The Trident II SLBM in service with the Royal Navy has a range of over 4000 miles (5000km).and is technically capable of delivering twelve warheads. According to the Financial Times (£) on 4 August, the Indian Space Research Organisation (ISRO) expects authorization from the government for launch in 2013 of a Mars orbiter. The article quoted a development economist’s statement that half of India’s population lack sanitation and in 2010 30% were subsisting on less than US$0.50 per day, and that half of India’s children are malnourished. Of children under five, 42% are underweight. The UK intends to provide foreign aid of about £280 million a year in India until 2015, aimed at the poorest people in the poorest states.